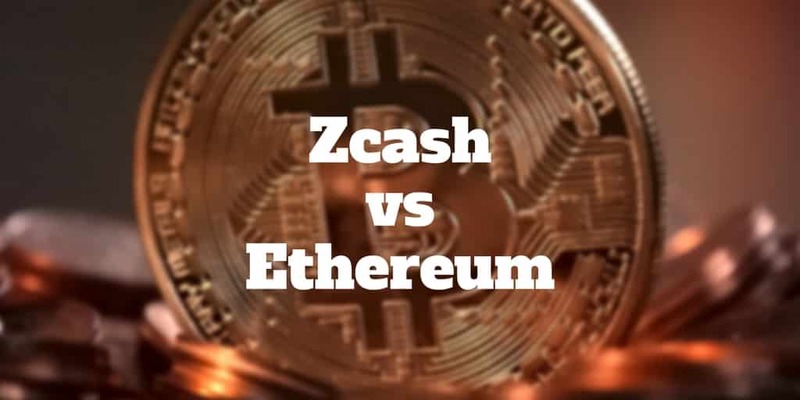 Home › Investing › Cryptocurrency › Zcash vs Ethereum: What Is The Best Cryptocurrency? The phrase “Zcash vs Ethereum” sets an expectation that one cryptocurrency is better than the other. But Zcash and Ethereum are designed to improve upon Bitcoin, albeit in different ways and may even be complementary. Zcash provides enhanced security to users compared to Bitcoin while Ethereum is rapidly becoming the “operating system” upon which applications can be built similar to how iOS is the operating system Apple uses to support applications, such as Uber, and Airbnb. Zcash was formed because all transactions on the blockchain are public when using Bitcoin, thereby creating privacy concerns. Even though owners of bitcoin addresses are not explicitly identified, a privacy issue crops up that Zcash solves. Ethereum also solves a Bitcoin problem that Vitalik Buterin – Ethereum founder – first tried to address within the Bitcoin community. Rather than using Bitcoin purely as a cryptocurrency, Buterin believed a foundation was needed that could support applications and smart contracts, such as buying insurance or even managing music rights. So while both Zcash and Ethereum solve different problems, if you had to choose between Zcash Vs Ethereum, which would it be? Which Cryptocurrency Is Best: Zcash or Ethereum? Zcash [ZEC] was introduced in October 2106 as a cryptocurrency like Bitcoin that provides users with enhanced security. Like Bitcoin, Zcash has a fixed supply of 21 million units. In the first 4 years after launching, a 20% ‘founders reward’ is allocated to developers, investors, and a non-profit foundation. It is quite common that early contributors receive a slice of the pie. Bitcoin founder Satoshi Nakamoto is reputed to have over one million bitcoins. Zcash has been so successful in overcoming privacy issues relating to Bitcoin that founding team member, Zooko Wilcox-O’Hearn, has highlighted that a “selective disclosure” option is available to allow buyers and sellers of goods and services using Zcash to comply with anti-money laundering regulations. If you had a choice between Zcash Vs Ethereum Vs Bitcoin to stay anonymous, Zcash is probably your best bet. Where most cryptocurrencies aim to replace conventional currencies for day-to-day transactions, Ethereum has even greater ambitions. The founder of Ethereum [ETH], Vitalik Buterin, described it as a foundation layer upon which applications can be built. Just as you turn on your Android phone or Apple iPhone and can select from millions of applications, such as Lyft, Munchery, Postmates, Uber, and so on, so too can Ethereum support a diverse range of applications that relate to the blockchain. The blockchain is simply a ledger, or a list of records called blocks that are connected and secured using cryptography. Ethereum acts as a decentralized platform that runs “smart contracts”, which are applications designed to run without the possibility of censorship, downtime, third party interference, or fraud. These apps can run on a custom-built blockchain, a shared global infrastructure that can move value from one person to another. So, Ethereum can be used by developers to create markets, store registries of debts or promises, and move money without any need for a middleman or counterparty risk. Because of its enormous untapped potential to remove the need for banks as intermediaries for money transfers, insurance companies to purchase insurance, buy and sell real estate and many more uninvented applications, Ethereum is different from Zcash, which is a pure cryptocurrency. Whether you are buying Zcash or Ethereum, you will need a wallet to store your digital currency. If you are new to cryptocurrencies, the first step is to exchange your real world currency for digital currency. Coinbase is one of the best known and most successful digital currency exchanges where you can buy Bitcoin, Bitcoin Cash, Ethereum, and Litecoin using an existing credit card, debit card, or even Paypal. Kraken is another online destination that is not as user-friendly but has lower fees. It acts more like a forex marketplace. But instead of buying euros and selling yen, you can buy Zcash and sell Bitcoin, or buy Ethereum and sell Zcash, along with many other possibilities. Once you have converted U.S. dollars to Zcash or Ethereum, you need to store them in a wallet. Coinbase and Kraken automatically provide you a wallet, so you don’t need to worry about finding another online wallet. However, Coinbase does not support all cryptocurrencies, so if Zcash or any other cryptocurrency you want to own is not available for purchase then you will need to first exchange your Ethereum, Bitcoin, or Litecoin for say Zcash and then store it. One of the better known wallets is MyEtherWallet, which is free and allows you to interact with the blockchain while remaining fully in control of your keys and your funds. Unlike a bank, which keeps track of your personal information, passwords, balances, transactions, and money, MyEtherWallet acts only as an interface. So unlike a bank, it won’t charge fees to manage your account and charge for services, such as refunding your money if your credit cards get stolen. A bank will also limit how much you can send, where you can send it and how long it will hold your deposits. On the other hand, MyEtherWallet will not charge you any transaction fees. When you use MyEtherWallet, a cryptographic set of numbers is generated: your private key and your public key (address). Your private key, password, and account information are not stored by MyEtherWallet. If you share your public key with someone, they can send you ETH or tokens. In general, you will never want to share your private key because that would give someone else full control over your account. When you choose a cryptocurrency wallet, you have a choice between offline or online storage. Ledger Nano S is a hardware wallet that looks very similar to a USB storage device. It has a built-in display so you can see transaction confirmations. And it supports a wide range of cryptocurrencies, including Bitcoin, Ethereum, Zcash, Dash, Dogecoin, Litecoin, Ripple, Stratis, Ark, Komodo, Ethereum Classic and Bitcoin Cash. Hardware wallets like Ledger Nano S can be stored in a safe deposit box in a bank vault for further protection. In fact, the Winklevoss twins, who used $11 million from their $65 million Facebook settlement to buy bitcoins in 2011, store their coins in hardware wallets in safe deposit boxes across the United States for maximum protection. Zcash is a cryptocurrency like Bitcoin, but with enhanced security, while Ethereum is a decentralized platform upon which other applications can be built – you can even launch your own cryptocurrency or tokens. ✅ Enhanced Security: Compared to Bitcoin, Zcash provides enhanced security to preserve the anonymity of buyers and sellers. ✅ Decentralized Platform: Ethereum makes it possible to run a wide variety of applications while limiting fraud, censorship, and third party interference. ✅ Limited Coin Supply: Zcash has a limited total supply compared to Ethereum, which has a limited annual supply of coins only with no stated limit, causing more uncertainty in how to value ethers. ✅ Smart Contracts: Ethereum is designed to make it possible to make agreements without the need for a third party in a more trusted format, thereby lowering costs for applications such as money transfers, real estate transactions and insurance premiums. ✅ Enterprise Ethereum Alliance: Fortune 500 companies have come together officially to build applications for the real world based on Ethereum. ✅ Easier To Buy: For new cryptocurrency investors, Ethereum is easier to buy because it’s supported by major digital currency exchanges, such as Coinbase. Zcash vs Ethereum characterizes the two cryptocurrencies as competitors but in reality they have the potential to be complementary to each other. Ethereum is designed as a decentralized platform that supports a wide variety of applications that rely on blockchain to lower the cost of transacting by removing third parties and lower counterparty risk. Zcash, on the other hand, is designed to improve upon the security issues associated with Bitcoin. Together Zcash and Ethereum can be complementary because Zcash can reduce transaction visibility and boost privacy while Ethereum can act as the “operating system” of the crypto world. The bottom line is Zcash and Ethereum are less cryptocurrency competitors as much as they are helpful to each other by solving different issues associated with Bitcoin. Have you traded Zcash or Ethereum? Tell us what you think about cryptocurrencies. We would love to hear from you.